What is a Space Heater? "If it were not for this site, I would have been lost. Your site afforded me the know how. Now, I can't wait for the winter to use it. One of the most appealing things about wood stoves is that they operate silently and without the use of electricity – a rare thing in today's world. In general it is preferable to arrange things so that heat from the stove naturally flows to where it is most needed, making the use of fans for heat distribution unnecessary. An example of house layout for good heat distribution is a two story house with a basement. The stove is located on the open plan main floor. The bedrooms on the second floor naturally stay a little cooler, which suits a lot of people. The basement also stays cooler, which is fine if it is mainly storage and utility space rather than living space. Provided it is reasonably well sealed and insulated, this house could be heated effectively with a single wood stove and need no fans to circulation air. However, most people don't have the luxury of designing their house around space heating with wood, so for many, something must be done to improve the circulation of heat around the house. Don't connect a stove to the return air ducts from a central heating system. This can fill your house with carbon monoxide.People who install their stoves in basement rooms in order to keep fuel, dust and wood chips out of living areas, have real difficulty moving heat upstairs. There is no effective solution to this problem which is why we strongly discourage that location. Floor grilles can be installed to encourage the heat to rise to the main floor, but our experience is that such grilles have to be very large to make much difference. Plus the warm air must have a path up to the main floor and an equally large path for replacement air to return to the basement. Whatever you do, don't try blowing air from an enclosed basement room to the upstairs. The resulting depressurization could cause a big backdraft. If you want a wood burner in the basement to heat the upstairs, get a forced air furnace or boiler, not a wood stove. Buyers of new stoves are sometimes encouraged to buy the optional fan that is offered by the stove's manufacturer. The thinking is that the fan will boost efficiency and help circulate warm air. But we've seen little evidence that they make much real difference, although they do give the impression that they are boosting efficiency because they blow hot air around. Besides, they are expensive and they usually rattle. 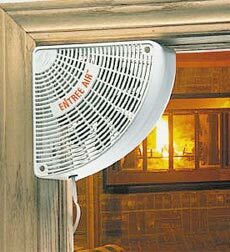 The one serious heater that may need its fan is a fireplace insert, but these fans don't tend to be optional. Ideally, any kind of air circulating fan should work with, not against, the natural convection currents set up by the stove. If air currents were visible, you'd see cool air sweeping across the floor towards the stove, enveloping it, then rising in a big plume towards the ceiling. That plume probably moves more air than any stove fan, and it moves silently and for free. So, if you want to move heat to somewhere else, the best place to take it is from ceiling level somewhere in the room where the stove is. You don't need to take it from directly above the stove. High level cold air returns can recirculate hot air from ceiling level.People who are building a new house that will have a conventional forced-air heating system as well as a wood stove can ask their heating contractor to locate one or two cold air return grilles at ceiling level in the hearth room. With high level cold air returns, the furnace fan can be operated continuously on low speed to move heat around. This approach can be very effective. Note that furnace fans can be costly to run continuously and they do create a constant background noise. There are programmable furnace fan timers on the market which address these concerns. By using a timer that cycles your fan operation on and off during the day, you can save on electricity and reduce overall noise. Well-placed ceiling fans can work well in houses with cathedral ceilings so that all the heated air is not wasted up in the roof area. Ranch style houses can be hard to heat with a single stove because they are so spread out. Here are three strategies to move air down hallways to spaces remote from the hearth room. If you open the area above a door (transom), air can flow better between areas of the house.The wall between the top of a door or archway and the ceiling is called the transom and it is the greatest barrier to horizontal heat movement in houses. If you remove this section of wall, the warm air at ceiling level of the hearth room can flow easily down a hallway or into the next room. Larry, one of our correspondents, sent us this picture (right) of his handiwork. Note the open space above the door, nicely trimmed to match the original doorway. The casual observer wouldn't even notice the change. Larry reports that opening the transom really helped to even out the temperature in his house. 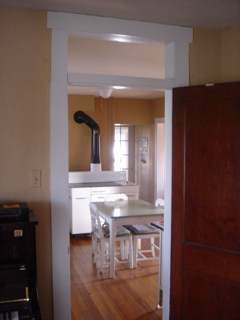 If you don't want to do structural work to a door transom, you could install one of the small doorway fans shown at left. They probably move less heat than an open transom and they do use some electricity, but if you just want to try something simple, they are an inexpensive option. If you want to get a little more aggressive in moving air down a hallway, and you want to preserve privacy, you could install a grille in the transom connected to an inline fan and a duct running down the hall ceiling to an area to be heated. The whole affair could then be boxed in. The photo at right is of a bathroom exhaust system kit using an inline fan that could be adapted to move heat. An inline fan.One thing we've noticed is that heat distribution tends to be less of a problem in well sealed and insulated houses. In older leaky houses, it is very hard to keep remote rooms warm when heating with a centrally located stove because heat loss from these rooms is so great. Cold air comes in past leaky windows and heat conducts to outside through poorly insulated walls. In contrast, tight, insulated houses retain heat well so less heat is needed to keep remote rooms comfortable. Reasonably tight basements don't usually get cold enough to freeze even when they don't receive direct heating from a main floor stove. All spaces within the walls tend to stay within a much narrower temperature range than in leaky houses. So, if you are having trouble keeping part of your house warm enough, one strategy is to reduce heat losses there by sealing leaks and adding insulation if possible.